She looks unrecognizable now — and has the biggest smile. There's no underestimating the transformative power of kindness, compassion and love. Just ask this sweet puppy named Ellen. For her, they've changed everything. 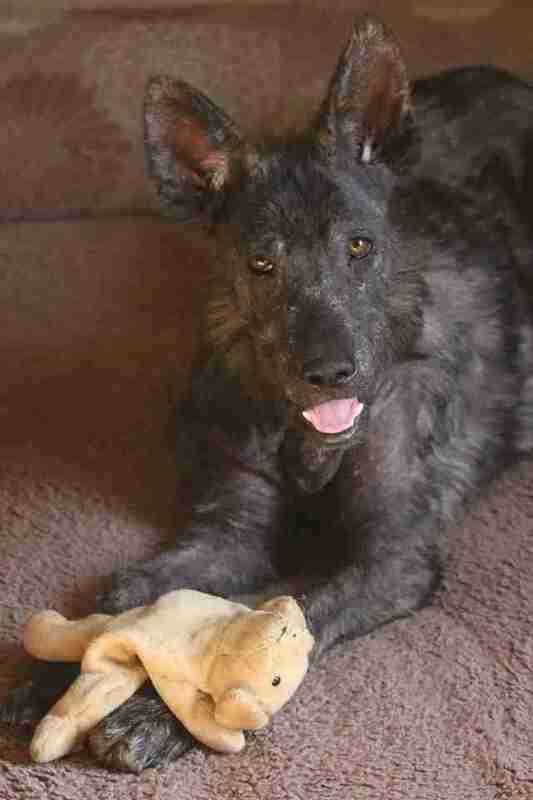 Earlier this month, 5-month-old Ellen was living on the streets of Fresno, California — a stray dog without a friend in the world. 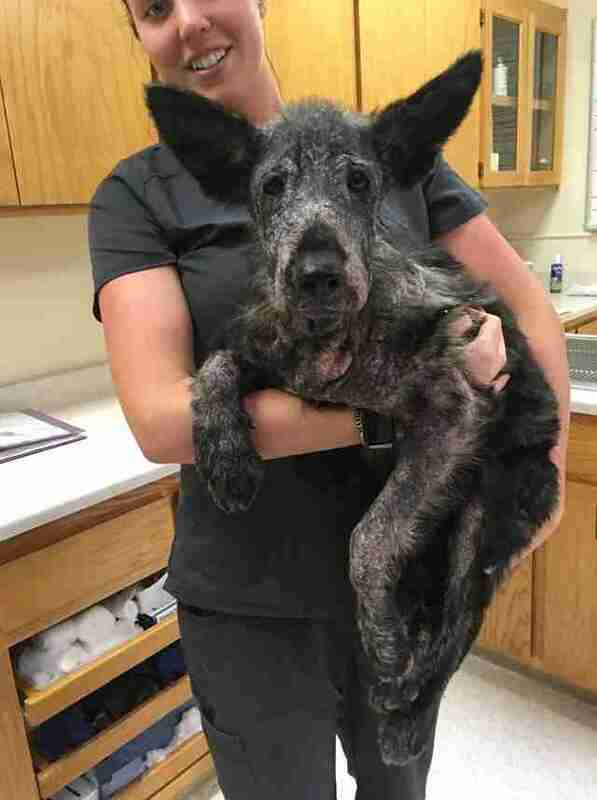 By the time a local shelter picked her up, her health was so poor that the director there reached out to Shirley Zindler of the Dogwood Animal Rescue Project for help. 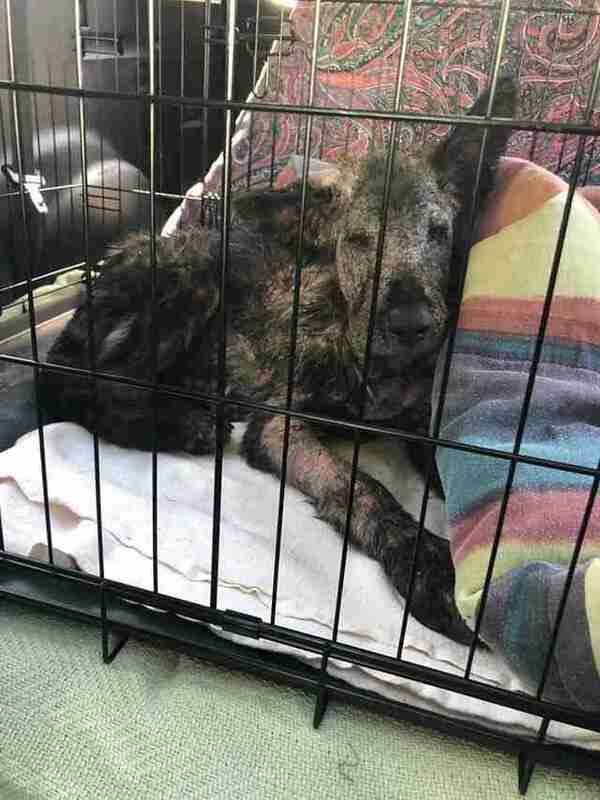 "She was very weak and suffering from a terrible case of mange, malnutrition and was covered in sores and wounds from many, many foxtails piercing her skin and causing infection and abscesses," Zindler told The Dodo. "She was truly a sad, sick little girl." Despite her young age, Ellen seemed to have already given up hope. 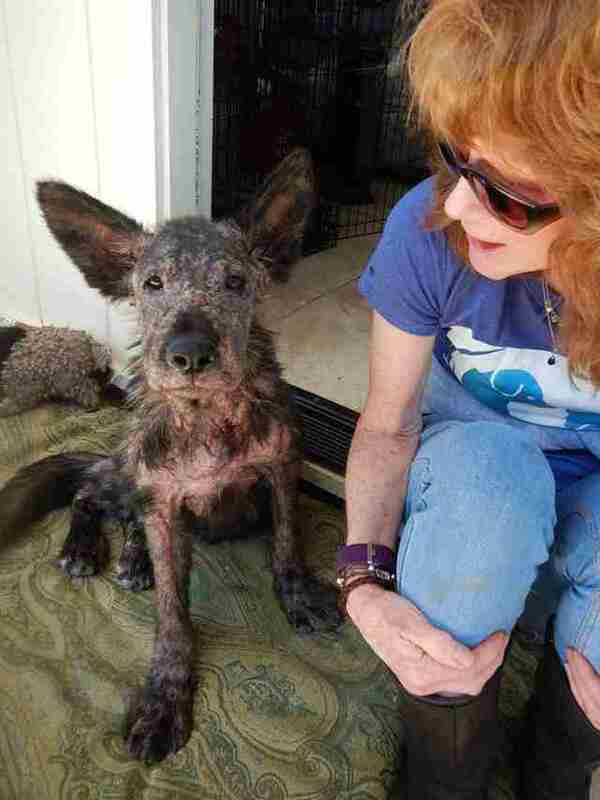 Zindler, a seasoned animal rescuer, was shocked by Ellen's condition after bringing her home. "The sight of her and the stench of infected skin was horrifying," Zindler said. "Her skin was so raw that there was almost no place we could touch her without hurting her. Even her ears were full of foxtails." Though Ellen might have felt that things would never improve, her rescuers knew she was worth saving. Ellen had no idea things were about to get so much better. 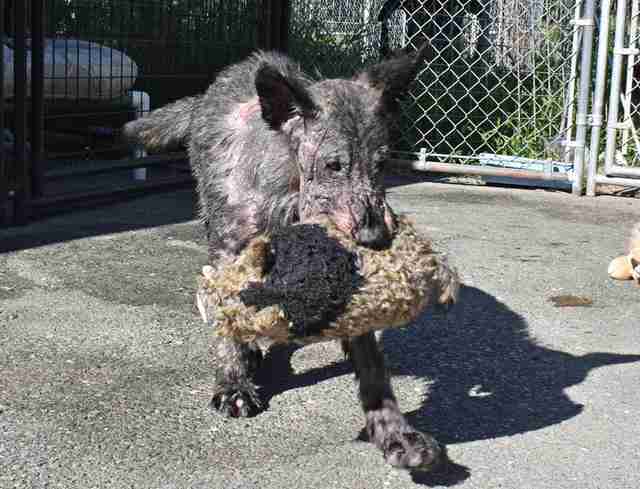 The dog's rescuers soon set her on the path to recovery — both in body and in spirit. 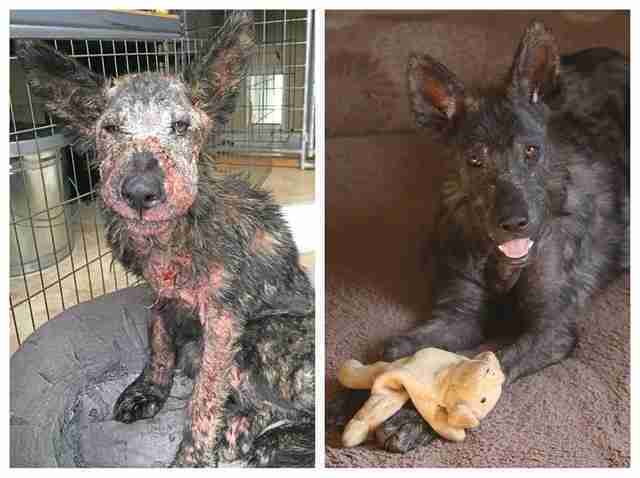 "She was given a medication to kill the mites causing the mange, and antibiotics to help her fight the infection. 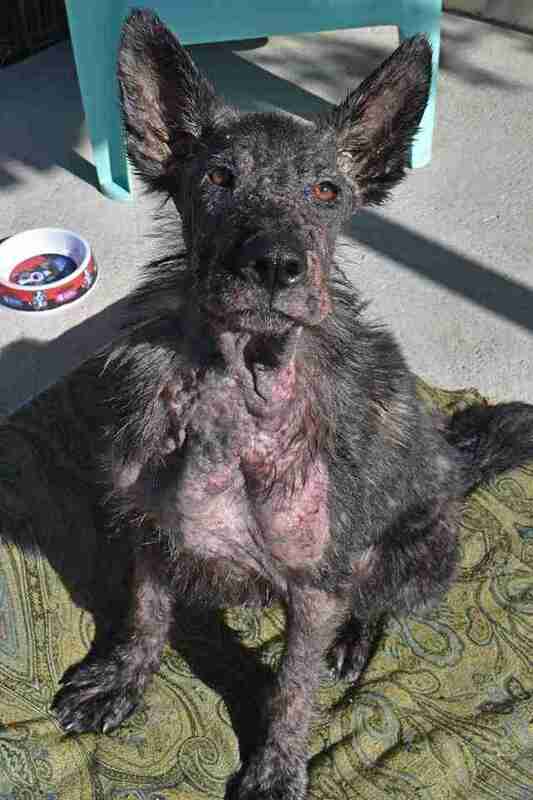 She gets daily medicated baths to help soothe and heal her skin and a slow refeeding schedule to help her body adapt to processing quality food again," Zindler said. "And she gets a lot of love and attention for her emotional well-being. Animals and people cannot thrive without feeling safe and cared for." Before long, the formerly sad Ellen came to realize that there is more to life than pain and loneliness. 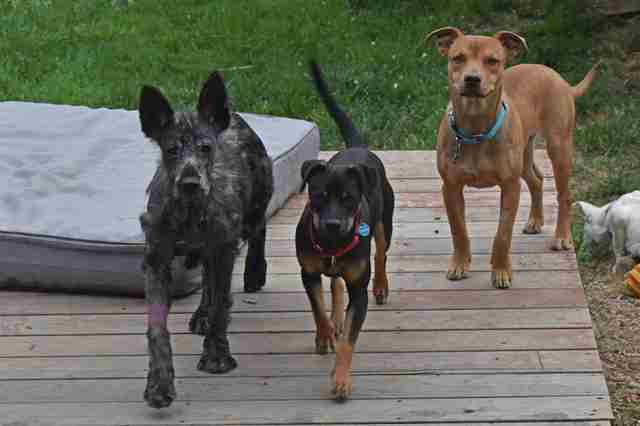 She's even made a few playful canine friends to share in her newfound joy of being a pup. The impact of all this love now in Ellen's life couldn't be clearer. Just two weeks after being taken in by the Dogwood Animal Rescue Project, she looks like a totally different dog. Ellen still has a ways to go before her body heals completely, and a fresh coat of fur fills in the spots where her coat's still patchy — but the sparkle in her eyes suggests her broken heart has been quicker to mend. And with adoption offers already rolling in, her future has never looked better. "We're extremely hopeful for a full recovery and wonderful life for her," Zindler said. Although it takes plenty of dedication and time to help sick and neglected animals heal, the improvement they make day to day comes as its own reward. "Rescue is so hard and sad sometimes," Zindler said. "But watching a dog like Ellen start living the life she deserves makes up for so much heartbreak." 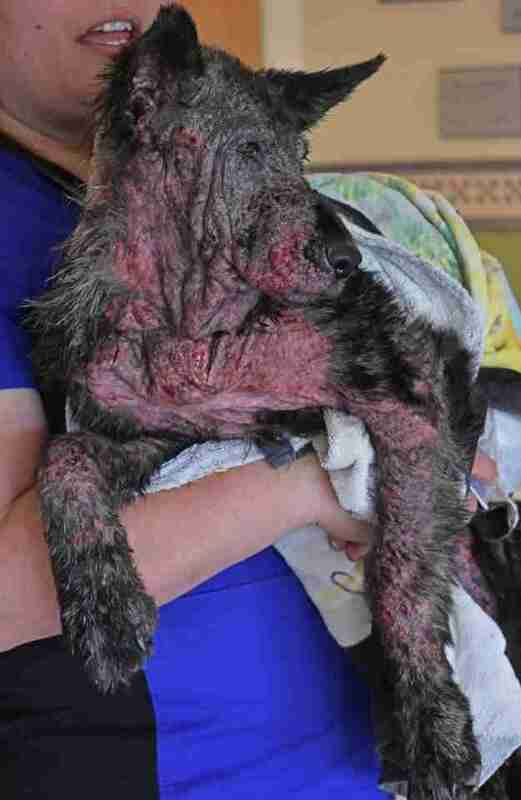 Visit Dogwood Animal Rescue Project's website to find out how you can help support rescues like this one.